Dubai: The killing of Yemen’s longtime strongman and ex-President Ali Abdullah Saleh by the country’s Shiite rebels as their alliance crumbled amid street clashes in the capital, Sana’a, has thrown the nearly three-year civil war into unpredictable new chaos. While most analysts say that Saleh’s slaying gives the rebels the upper hand in the short term, the broken alliance between Al Houthis and forces loyal to Saleh appears to be permanent which will help the Yemeni government and its backers in the Saudi-led coalition weaken the grip of Iran-backed Al Houthis on the country. While politically Al Houthis would have absolute control going forward, they are likely to lose territories given the reduction in manpower, Ayham Kamel, head of Middle East and North Africa at Eurasia Group in London has said. 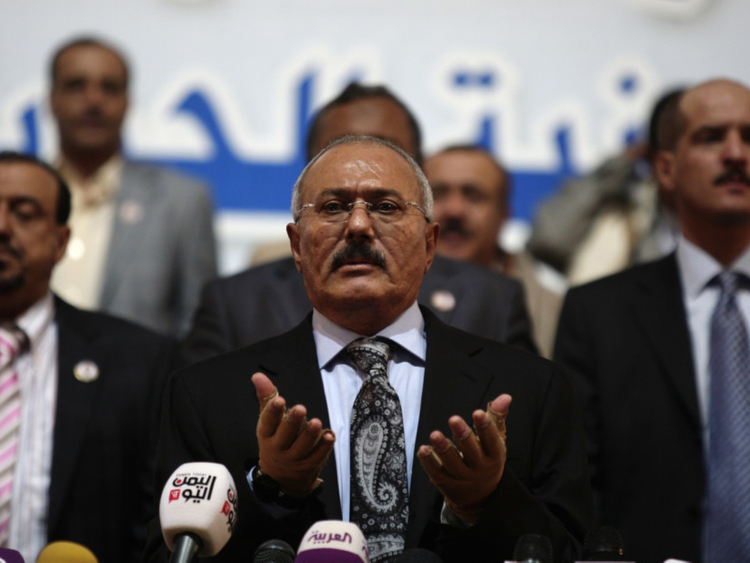 Irrespective of Saleh’s fate, “the split between Al Houthi forces and the pro-Saleh forces appears to be permanent and appears to set a new stage in the Yemen conflict,” he added. “Saleh has always been a skillful politician who shifted alliances based on regional dynamics. In that respect he was both part of the problem in Yemen and part of the solution,” Kamel said. On Monday, Al Houthis released a video, apparently shot by one of the attackers, showing an Al Houthi crowd picking up Saleh’s dead body, wrapped in a blanket, off the ground and lifting it onto a pickup truck. Saleh’s eyes appeared wide open, the back of his head badly injured, and his shirt blood stained under a dark suit. He remained in the country, however, and continued to wield power from behind the scenes. In 2014, his forces allied with Al Houthi militia, despite the fact that as president he had gone to war with them on more than one occasion. The alliance between Al Houthis and Saleh splintered last week, setting off heavy clashes between Al Houthis and Saleh’s forces. “Saleh was such a towering figure in Yemeni politics, and he was always the person best able to speak to absolutely everyone, that it’s difficult to see anyone else being able to fill his shoes,” said Peter Salisbury, senior research fellow at Chatham House’s Middle East & North Africa Programme. Saleh’s death has deprived the Saudi-led alliance of the one person they could have struck a deal with - because he was able to rally other factions behind him, Salisbury said. In the short term, his death is likely to increase violence in Sana’a as Saleh forces will be looking to retaliate and Al Houthis might attempt to retake areas of the capital lost in recent days, Miriam Eps, regional security analyst at Manama-based risk management consultancy Le Beck International. “With Saleh’s untimely death, the entire process for solving Yemen’s problems just escalated dramatically,” Theodore Karasik, senior adviser at Gulf State Analytics, said by phone from Oregon. “By removing Saleh, Al Houthis have created a larger problem for themselves. Saleh’s removal throws everything into doubt. And now it’s time for Plan B,” he added. In a televised speech after Saleh’s death, the internationally-recognised Yemeni president Abd Rabbo Mansour Hadi, rallied his troops which are trying to reverse an Al Houthi coup on the country. “Let’s put our hands together to end this nightmare,” Hadi said. He said his government forces would support any “uprising” against Al Houthis in Sana’a. An official in Hadi’s government told The Associated Press that members of Saleh’s political party and military forces were cooperating with the coalition and would provide coordinates for air strikes against Al Houthis. He said strikes will intensify so that the closest pro-Hadi ground troops—located at Nehm about 48 kilometres northeast of Sanaa—can push toward the capital. The hope is that as the forces advance, tribes in the area will be encouraged to rise against Al Houthis, he said, speaking on condition of anonymity to discuss the plans. Suze van Meegen, the Sana’a-based protection and advocacy adviser for the Norwegian Refugee Council, said the violence left aid workers trapped inside their homes. “No one is safe in Sanaa at the moment. I can hear heavy shelling outside now and know it is too imprecise and too pervasive to guarantee that any of us are safe,” she said. Witnesses said the bodies of slain civilians and fighters littered the streets as no ambulances were able to reach the area. The ICRC said at least 125 people had been killed and some 240 wounded in Sanaa since the fighting began last week. On Tuesday, the Saudi-led coalition conducted at least seven strikes on the presidential palace, witnesses said. The Saudi-led Arab coalition entered the Yemeni war in 2015 just months after an Al Houthi-coup forced Hadi out of power. The war has cost the lives of thousands of Yemenis and pushed the Arab world’s poorest country on the brink of famine. Iran has come under international condemnation for smuggling weapons into the country and recently an Al Houthi-launched ballistic missile fired towards Riyadh—we was intercepted—was declared an ‘act of war’ by Saudi Arabia. Gulf and Arab leaders have long sounded the alarm to the international community that Iran’s meddling in the region was not only detrimental to Arabs but also for the world.